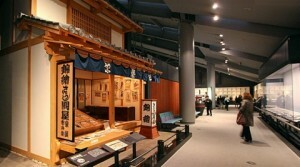 A museum dedicated to the history of the city of Tokyo in the Edo period, Meiji and Showa, was opened March 28, 1993. 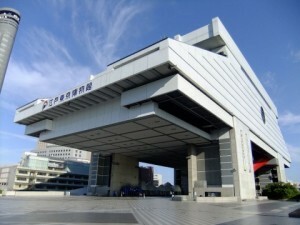 The unusual design of the building – the result of the work of the architect Kiёnori Kikutake. 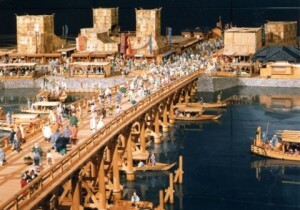 The museum gives visitors the opportunity to closely in touch with the Japanese capital history and to feel a part of it: because the main exhibition hall presents you a full-scale model actually existed once places and objects – such as, for example, Nakamuraza theater, traditional Japanese house in a few rooms and Nihonbashi bridge, which once was the main bridge of Edo *; secondly, miniature models: they will help to create an impression of life in a traditional Japanese village and a detailed review of the ancient castles and fortifications; and thirdly, of course, the museum presents original artifacts – clothes, jewelery, ancient manuscripts and more. On weekends, the museum holds regular theater performances, besides addition to the main exhibition in the museum often organizes temporary exhibitions, one way or another connected with the history and culture of Tokyo. For those wishing to learn more about this amazing city, be sure to visit the Edo-Tokyo Museum in the open air, which is part of the museum complex – there are presented interesting examples of old architecture of the capital. 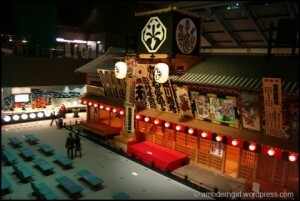 * For a long period of time, Tokyo was called Edo.